In the Iowa statehouse, there’s this doll cabinet. 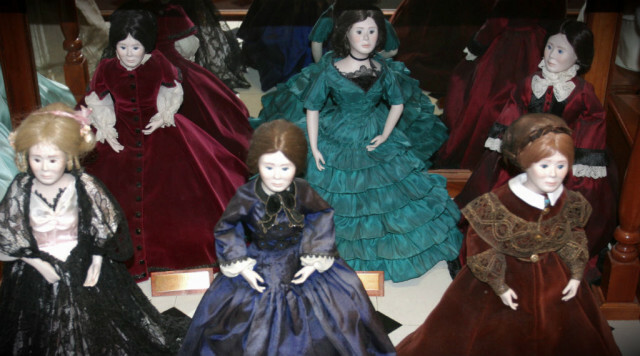 Amid the political regalia surrounding it, the cabinet stands out, filled as it is with dozens of dolls, each with its hair immaculately styled, each dressed in a gorgeous gown, all bearing the exact same porcelain face. The figurines reflect a tradition begun by former Iowa first lady Billie Ray in celebration of the state’s centennial in 1976. She wanted to honor Iowa’s past and future governors’ wives with commemorative dolls, molded in Ray’s own image. Each of Iowa’s 43 first ladies is represented, dressed in a Barbie-sized version of the first lady’s inaugural gown and identified (in most cases) with a small placard carrying the governor’s name — “Mrs. Robert Ray” or “Mrs. Samuel J. Kirkwood.” So in the same place where Hillary Clinton and Carly Fiorina were just furiously campaigning to become the first female President of the United States, several dozen women share the dubious honor of being distinguished solely by a hairstyle, a dress, and a man’s name. I often wonder how that doll cabinet will honor Iowa’s first first spouse who isn’t white, or a woman. This hasn’t been a consideration previously; all the governors and their spouses so far have helpfully fit the pattern. But demography, along with a multi-generational pivot in American gender dynamics, have rendered that status quo shatteringly delicate. One day they’re either going to have to stuff the likeness of Mrs. Robert Ray into a man’s suit, paint that porcelain doll brown, or rethink the entire exercise. That doll cabinet is already a museum piece, even if it doesn’t know it yet. You can look at it and see the era it represents becoming suddenly untenable. I’ve come to think of that type of moment — when you can mark the instant before and after something slips into history, just as it’s happening — as rare and intensely valuable. A dozen years ago, Robin and I shared one of those moments. Over the course of a few weeks in early 2004, we came to realize that our then-present experience of media and technology was fast becoming an anachronism, and that there were a lot of people—journalists in particular—who weren’t aware of that. We imagined ourselves looking back on that era before tiny, powerful computers colonized every corner of the world, and marveling at how strange and foreign it would already seem just ten years later. We shaped these imaginings into a rough little movie that is still one of the most popular things I’ve ever had a hand in making, and I credit some significant part of its resonance to the way we flipped the lens — projecting not forward from our past experience, but backward from the future. To know the future … that’s the dream, right? But it’s a dream that makes sense only if the future is merely revealed, rather than being constructed bit by bit from the traces of the present, which we still have the ability to shape. Let me argue instead for seeking future history — the ability to consider the present through the lens of the future, to find imminent anachronisms hidden in plain sight. What do we take for granted today that will come to seem remarkable tomorrow? What will the history books say about us? A few months ago, my friends Andy, Amanda, and Amy, and I decided to build a weekend around these questions. And now I’m seeing future history everywhere. Like all right-thinking people, I’ve been infected with Hamilton fever. The theme of the show that resonates most loudly is the obsession of all the central characters with their place in history. After one recent replay of the score, I found myself tearfully re-reading Washington’s farewell address, a message sent across the ages, to us. Of course, nearly every Presidential farewell has that time-capsule quality — it’s the last best chance for a President to spin his legacy. But fast-forward through more recent ones, and Washington’s stands out all the more. Other Presidents are aware of the watchful eyes of history, but they spend most of their parting speeches dwelling on the recent past — what they saw, what they did, why they did it. Consequently, moments in these speeches can seem parochial or short-sighted, just decades later. “There hasn’t been a failure of an insured bank in nearly 9 years,” Truman says. “The Persian Gulf is no longer a war zone,” Reagan says. We’re “on track to be debt-free by the end of the decade,” Clinton says. For a weekend in Baltimore in April, we’re going to look for moments like this, and scour our own experiences for ideas and lessons that will endure. We’ll make a time capsule, and we’ll end with a prom; we couldn’t think of two better ways to bring a far-seeing lens to the present. It will be massive fun and I hope you join us if you can. But most of all, I want to know: What do you see around you today that will come to seem remarkable? This entry begins my week in the Snarkmarket Seminar, but even if you’re not a seminarian, you should feel welcome to comment here! Before we continue, I’m going to ask you to play a game called Parameters, for at least 20 minutes, or until you beat it, whichever you prefer. I’ll warn you that the game is pretty cryptic, so you’ll probably need to click around for a while until you start to get the feel of things. But I’d ask that unless you completely hate the experience, you give it about 20 minutes before you give up. Here’s the link. You can play for as long as you’d like, and truthfully, you don’t have to play to engage with the questions and ideas I’ll be presenting here. But I think it’ll help. So I’ll pause now, and wait for you to return. How was that? Was it fun? I genuinely want to know, so if you’d pause one more time and take a quick survey — which you’ll find here — I’d appreciate it. In case it’s not clear, Parameters is basically a spreadsheet. That’s reductive, of course. There’s a lot more to it than your average spreadsheet. And clearly plenty of thought went into the feeling of the game-ish aspects of it, the way the money and experience come bouncing out of the boxes all random and fun, the little animation of attacking the boxes with your mouse and watching the colors recede and rebound as you click. But a determined developer with some time, elbow grease and Google Apps Script could probably create something reasonably close to Parameters in a Google Spreadsheet. When I play Parameters, though, I recognize it as a deconstructed version of every role playing game I’ve ever played. So let me talk about role playing games — RPGs — for a second. This is the opening scene to the game Skyrim — a pretty recent RPG. I’m just going to shut up for a second and let you watch it. To me, this is kind of gorgeous and cinematic — slowly waking up to this wintry world, bound in the back of a wagon. As a player of the game, you have very little agency at this point. You can look around, but that’s about it. As the first 10 or so minutes of the game progress, they’ll start taking off the training wheels and unveiling more and more of the game’s controls bit by bit. This allows you to get a handle on the game’s basic mechanics and storyline before they send you out into this incredibly detailed world. But once that tutorial is done, part of the majesty of the game is how thoroughly rendered it all is. Every tree, every mountain, every path that you’ve glimpsed during this little opening segment is a part of the world you’ll be able to visit and interact with. Many of the plants you pass along the side of the road during this opening wagon ride are actually available to harvest later if you’d like. Skyrim is so extraordinarily detailed, you could actually sort of live in this world if you wanted to. You could buy a house, make a living for yourself hunting animals and selling their pelts to merchants, find a partner, get married. But so that you don’t get overwhelmed with all of that at the start, they introduce you to that world this way, bound by your digital hands, encountering one by one all the incredible varieties of things you can do. It’s a pretty sharp contrast with Parameters, isn’t it? That opening screen written in Japanese wasn’t really that much more helpful to me after I found the “English” button. It’s hard for me to think of two more different introductions to a game than these. Yet Parameters is essentially Skyrim boiled down to its basic essence. I’m being very reductive when I say that, but on a fundamental and important level, it’s true. The fundamental structure of both of these games goes back to Dungeons and Dragons, and probably even before. You’ve got your hit points, your stats like attack power and defense power and endurance, you earn experience and gold by plundering caves and fighting enemies (or in Parameters’ case, yellow boxes). Parameters even presents the classic RPG phenomenon known as grinding, where in order to defeat more advanced enemies, you spend time hunting down and earning experience from lesser foes. So when I first found myself playing Parameters and getting the basic concepts, I quickly started imagining that RPG world. I saw the boxes as monsters and the locked black tiles as caves. I pictured the big box at the bottom of the screen as a dragon. The squares that let you pay to up your stats or purchase keys I saw as your classic merchants. All of these basic elements that you’d find in Skyrim or a Final Fantasy game or any other RPG are present in this game that’s basically a spreadsheet, and being familiar with this language, I found myself visualizing it in my head. This brings me at last to what I’m most interested in: that imaginative act. My thesis is that works like Parameters and so many other texts similar and not involve two mutual, symbiotic creative acts — the world constructed by the author, and the world constructed by the reader. By reader, of course, I also mean user, listener, watcher … this is “reader” in the sense that Beck might have meant it in his recent un-album “Song Reader,” which I’ll come back to in a minute. What I’m most particularly interested in is that second act of creation, the world the reader creates. Had I the talent and know-how, I could probably even take the world that Parameters inspires in my head and actually make a game engine that actually renders that big ol’ box at the bottom as a moving, fire-breathing dragon. And then I would have created Skyrim. But of course users actually do this with Skyrim! The game inspires them to build these hugely time-intensive, significant worlds on top of the worlds the game’s developers have already constructed. They’re called “mods.” There’s a mod for Skyrim that even turns the world of the game into the world of Game of Thrones, the HBO series based on George R. R. Martin’s series of fantasy novels. That type of creation — modding Skyrim — is basically a form of fan fiction, which is the most obvious manifestation of this creative act I’m talking about. And this is one of my first and biggest questions: What are the conditions that best inspire fan fiction? Why do things like Skyrim and Game of Thrones provoke people to spin out these stories into these enormous extended universes? How does a creative work inspire so much creativity in its audience? I’m interested in the fact that Parameters sparks this vivid world in my head, but I have no real desire to further manifest that in any essential way. It would seem that the difference between something like Parameters and something like Skyrim in terms of inspiring further output is that Skyrim gives you the foundation of this incredibly rich and detailed world. You don’t need to build the engine to turn the box into a giant dragon, the game’s engineers have already spent significant effort on doing that for you. 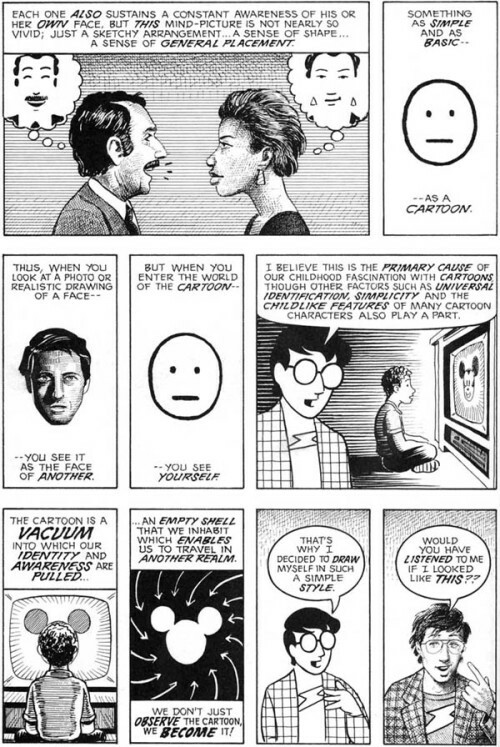 But then I think about Scott McCloud and his simplicity theory for comics, which suggests in part that the more room the author leaves us to imagine something, the more we can and do imagine, and so the more we can project ourselves into a world. He points out that our brains are hardwired to scan the world for this pattern: two dots in a circle. And that for most of us, we can’t see that pattern without imagining a face. This is why McCloud says he draws himself so simply: to help his readers with their worldbuilding. To give them more freedom to imagine him, and therefore to empathize with him. It feels like this idea clashes with what happens with worlds like those of Skyrim and Game of Thrones, worlds so detailed, they’d ostensibly leave the reader little space to imagine on their own. We’ve seen Skyrim’s depth, but let me talk about Game of Thrones for a second. Naturally, what would have happened is that the residents of Slaver’s Bay who spoke Ghiscari would have gradually moved over to High Valyrian, creolizing it along the way. It seems likely that an aristocratic class would have maintained a working knowledge of actual High Valyrian to use with emissaries from the Valyrian Empire, but the day-to-day language would have evolved in a way similar to French or Spanish (i.e. not like either of those languages, but evolving in the way that those languages evolved from Latin). The post goes on to share some of the Dothraki dialogue that would show up in the Game of Thrones Season 3 premiere. This is how many worlds have been spun out of that first giant world created by George R. R. Martin. A blog based on a language based on a show based on a series of books — each thing a whole lovely world of its own. This all suggests that rendering a world in extraordinary detail doesn’t seem to prevent others from building worlds of their own on top of it. So there’s another question for you: what is the relationship between how detailed a world is and how much worldbuilding it inspires? I’m interested in stories that cause their readers to build worlds because I’m interested in endlessness — for a long time I’ve been obsessed with stories that beget stories and worlds that don’t have boundaries. If you’ve been with Snarkmarket since the beginning, you probably recognize this as a theme of my thought. Here you’ve got a television series that purports to be fully post-media — the central conceit of the show is the title character’s blog, which all the show’s characters interact with constantly from a stunning variety of mobile devices. Although it struggles for Nielsen ratings, it was picked up for a full season allegedly because of its popularity on iTunes (indicating where the series’ audience is). And importantly, the show’s entire telos is allowing its audience to eavesdrop on the lives of a glamorous subculture. So far I’ve only really discussed fictional texts, but of course I’m interested in things other than fiction. I might even be mainly interested in things other than fiction. I think there’s something about texts that demand a lot of a reader — texts that require an investment just to enter the world of the text. It might be that that investment, once committed, is itself a spark to start creating. Parameters and Game of Thrones are both like this, in different ways. In Parameters, the demand is the opacity of the rulesystem; you have to spend some time just figuring out how it even works. In the case of Game of Thrones, it’s the very extensiveness of the world that makes it demanding, particularly if you’re actually talking about the books. But even the television series will stretch out over dozens of hours. But then there are texts that require creation to even get into the game, like Beck’s “Song Reader,” which I mentioned earlier. This is Beck’s most recent collection of music, only it’s not actually an album, it’s a book of sheet music. “Song Reader” fascinates me because it combines a pretty old phenomenon with a very new one. At one time, this type of thing was the entire music industry. Before records existed, artists didn’t release recorded music, they released sheet music. A piano was as ubiquitous a fixture in middle class homes as a speaker system or radio would be today. When a new song was released, you’d buy the sheet music, run home, and play it with your friends and family — a thousand little concerts happening in a thousand little homes. But today, we’ve got this enormous, super-popular infrastructure not just for playing these songs, but for sharing them worldwide. Each of those thousand little concerts is likely to get uploaded to YouTube. You can’t really call them “cover versions,” ‘cause there’s no original, per se. So this, this right here, this YouTube query for the song “Old Shanghai,” is basically the equivalent of the single. This strikes me as a sort of worldbuilding as well. Of course, several video games work this way, such as Minecraft and SimCity. They’re games that are actually canvases for creation. They’re more toys than games, even, like Legos or dolls. I think any creator can learn a lot from these things. But for the purposes of this discussion, I’m most interested in texts that are both discrete creative works in themselves and tinder for the creativity of others. Another question: is worldbuilding always valuable? I wonder about works whose creators actually sort of resist the act of worldbuilding. Mark Rothko, for example, asked viewers of his art to consider his works as complete, self-contained entities, not as landscapes or references to things outside the canvas. But whenever I see one of Rothko’s large, suggestive canvases, I almost can’t help imagining it as a window into a world. To do that, I have to consciously try to shut down the impulse in my head to read it as a landscape, to just dial it back to colors, textures, moods, and scale and that actually sort of disrupts my experience of the art. Let me build a world out of this, I want to tell Mark Rothko. But of course, he can’t prevent me, so I do. Journalists — particularly investigative journalists — are in the business of worldbuilding, whether or not they realize it. They’re trying to discover and connect facts in order to create a model of our own world, to understand it better. Just this week the International Consortium of Investigative Journalists (by the way, this is basically a shameless plug for their work; I’m on the board) released a massive investigation in partnership with news organizations across the world giving us a look at the shadowy domain of offshore tax havens. This is a corner of international society that operates in near-total darkness. Wealthy individuals tend to pad their offshore holdings with layers upon layers of intermediaries and puppet companies. Much of this is perfectly legal behavior to protect giant wads of capital, but some of it is intended to obfuscate laws and cloak illicit businesses. Because it all happens in this shadow corner of the world, it’s very difficult to figure out what’s what. Like many investigative projects today, this one has at its center a gigantic database, one that actually dwarfs the US State Department cables released by Wikileaks. So investigative journalists from all over the world partnered to take this data and construct it into a faithful and quite detailed model of reality. When we crowdsource an investigation like this one, releasing a giant data set and ask people to play with it, what I think we’re asking them to do is build a world with us, to participate in the mutual acts of creation. To create fan nonfiction. So there’s the essential question: How do authors of all kinds inspire readers of all kinds to build worlds? What are the magic ingredients of a creative work that let it yield more creative works? As you can tell, I’m leaving you with nothing but questions. But I haven’t yet questioned my premise itself. Is what I’m calling worldbuilding actually just creativity — is it just that creativity begets creativity? — or are these actually overlapping but distinct concepts? And if there is a difference between worldbuilding and creativity, is it merely that some of the worlds we create manifest themselves as works of their own rather than just sounds and images in our heads? So then how do you create something that cultivates that leap from the imagination to the canvas? Thank you for playing, watching, listening and reading. I’ll see you in the comments. (cc) Today is a good day / Flickr. I’d like to get a little meta about big ideas. As a journalist, I think a lot about how we develop and communicate big ideas (“big” in this context meaning “complex,” “weighty”). At NPR, we have no end of nuanced, complicated matters to unravel, and I’m convinced that the transition to digital will end up being a huge asset in this task, not a hindrance. But we need to advance in our understanding of how narrative can work online. “Big” ideas, examined closely, tend to resolve into a series of little ideas accumulated over time. So here’s my argument: To make our big ideas real, we need to develop better mechanisms for collecting and organizing all our ideas. Take TV as an illustration. Until the VCR began to go mainstream in the mid-’70s, television episodes were essentially self-contained events. With few exceptions, shows had to frame each episode for a potentially new audience, one that wasn’t necessarily attuned to the show’s continuity. As VCRs took hold, narratives on TV – ideas on TV – could become more complex. Because viewers could catch up on a series’ essential plot elements on videotape, it was easier for them to follow story arcs and keep track of important developments. Formula-driven shows like Dragnet (pre-VCR) gave way to complex dramatic narratives like Hill Street Blues (post-VCR). As VCRs gave way to the TiVo (the DVR) storytellers could offer even more complex arcs for audiences, paving the way for narratives of truly literary complexity and heft, such as the Wire. As we move deeper into streaming, and TV episodes sit increasingly alongside YouTube clips, “shows” will become yet more nuanced networks of ideas. Now think about the structures we’ve used to collect ideas on the Internet. Start with the RSS reader, the Internet’s VCR of ideas – fussy, difficult to program, but it too let us follow story arcs and keep track of important developments. And it was good enough to foster complex serial narratives like Talking Points Memo’s investigation of US attorney firings. A lot of folks say they’ve moved past the RSS reader. It’s not uncommon to hear us media types say “Twitter’s my RSS reader now.” But tweets and hashtags have obvious drawbacks for communicating complex ideas. I can say, “We need a TiVo for ideas.” I can point you to the hashtag “#tivoforideas.” Hashtags, as we’ve seen, can have tremendous power for collecting ideas at a moment in time. But partly because tweets are ephemeral – they quickly fade beyond search and memory – hashtags are poor vessels for binding ideas over time. Hence my big idea: We need to develop simpler and more powerful ways of collecting and following concepts across time. There’s much to learn from – hashtags, Storify, Wikipedia, Tumblr. But I suspect what we’re aiming for is a standard, not an app, a common convention, not a website. I want to be able to say, “Track the #tivoforideas conversation,” and watch this domain of thought develop over time as multiple thinkers add their input, and little ideas coalesce, gradually, into big ones. This, of course, ties in very much with the body of thinking I and others have been doing about the future of context. First Paul Ford and then Megan Garber have delivered powerful essays on the evolving nature of ideas in an era where streams have surpassed stories (e.g. Twitter replacing the RSS reader). I think about these two pieces all the time. Chase them with a reading of Megan’s essay on TED, ideas and authorship. PJ Onori started a similar conversation a little while ago at Adaptive Path, very much worth connecting to this one. (Thanks, @absi! ).